The large pantropical genus Ixora is well known for several ornamental species, which all originate from Asia. The continental African species were ill-known and badly delimited. They are revised in the present book which gives them a full taxonomic treatment. All 37 species (six of which are new) are described and illustrated with line drawings; full distributional data are given and summarized on maps. The native African taxa as well as the species frequently cultivated in Africa are keyed out. Presentation of data is user-friendly in that all essential information on each species is presented on two opposite pages. 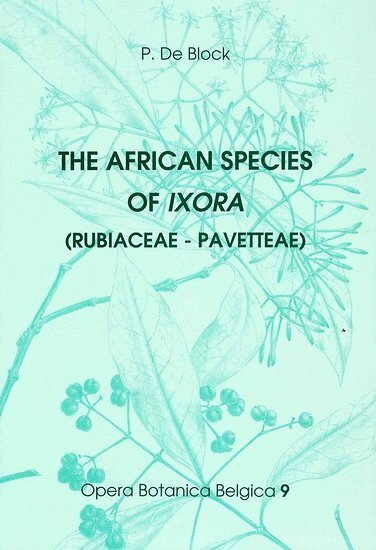 A general part documents broadly on morphology, anatomy, pollen morphology, biology and chorology of Ixora; it focuses on the continental African species but makes comparisons with Madagascan, Asiatic, American or Oceanic representatives whenever appropriate. The author is a postdoctoral fellow of the Fund for Scientific Research – Flanders (F.W.O. Belgium). 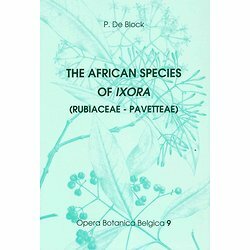 The revision of the African species of Ixora is a part of her doctoral thesis at the University of Antwerp (U.I.A. ).